Unfortunately, we will start 2015 in a wet and cool fashion. A hint of possible sleet has put us meteorologists in front of the computer models and checking out current atmospheric conditions early! I'll mainly focus on the upcoming 8 hours, as that is when the threat of any wintry precipitation occurs. The morning weather picture is shaping up much as anticipated, perhaps a degree or two warmer here at the earth's surface but about as expected in the lower levels of the atmosphere. 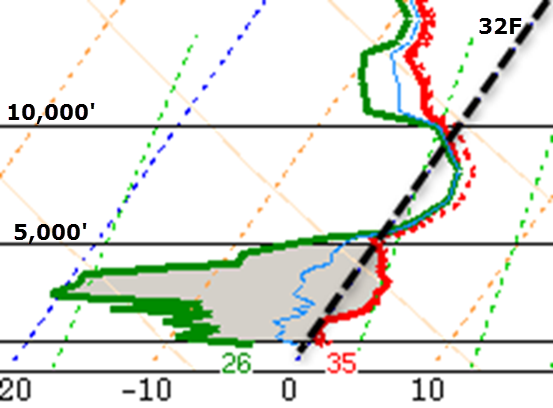 The 6am sounding from Little Rock (shown below, and which is fairly similar to what we have here in Memphis) indicates temperatures are above freezing up to about 10,000' with a pocket of near-freezing temps at about 5,000'. This level is also the upper bound of the dry air with saturated conditions for several thousand feet above that. As precipitation begins to fall this morning, it first has to moisten up the lowest 5,000' through evaporation. So initially, radar echoes will be primarily precipitation aloft that is evaporating before reaching the ground, resulting in "virga" but also setting the stage for rain this afternoon. During this process though, the temperatures in the lowest 5,000' will also cool a bit as humidity rises and the air saturates. When this happens, precipitation that is falling could encounter air that is sub-freezing (provided the cooling pushes the temperature down that far). The evaporation and encountering of sub-freezing air could result in a bit of sleet occurring here at the surface until the low levels saturate and warm to freezing or above. That process could take a few hours and looks to be complete by late afternoon. 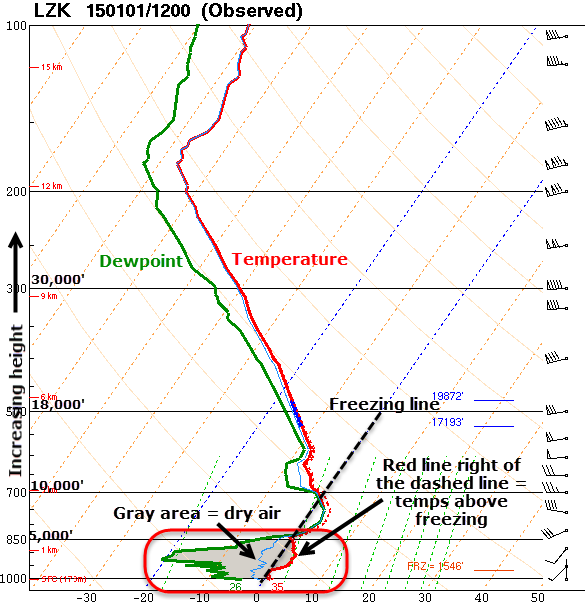 12Z (6am) Little Rock atmospheric sounding showing dry air in the low levels, saturation above 5,000', and temps above freezing up to 10,000', as described above. A closer zoom of the lowest 10,000' of the sounding above. Temps are near freezing at 5000', but generally above freezing up to 10,000'. Rain will be the predominant precip type, but some sleet could occur as the low levels moisten and some sub-freezing air is encountered by falling precip as that occurs. Initial precipitation could be a mix of rain and light sleet through the afternoon. Fortunately, temperatures here at the ground will remain above freezing (though they will likely cool from the upper 30s by a couple of degrees this afternoon). That means any sleet that falls melts and, when mixed with rain, washes off, so no significant impacts are expected and roads (even the elevated ones) should fare well. Looking a bit further out, mainly light rain is expected to continue off and on throughout the night (as temperatures remain steady above freezing), tomorrow (as temperatures rise just a bit into the lower 40s), and Friday night (as temps rise even more, perhaps to near 50). On Saturday, as developing low pressure moves by to our west, the Mid-South will get into the "warm sector" of the low with southerly wind pushing temperatures well into the 50s (models think perhaps the 60s). Heavier rain and some thunderstorms will be the result, ending as a cold front moves through Saturday afternoon. Behind the front, MUCH colder air moves back in as another Arctic high pressure system builds into the region. Sunday will be cold and windy with temperatures possibly falling into the 30s during the day. Now if we can just get these cold temperatures and precipitation to line up better! 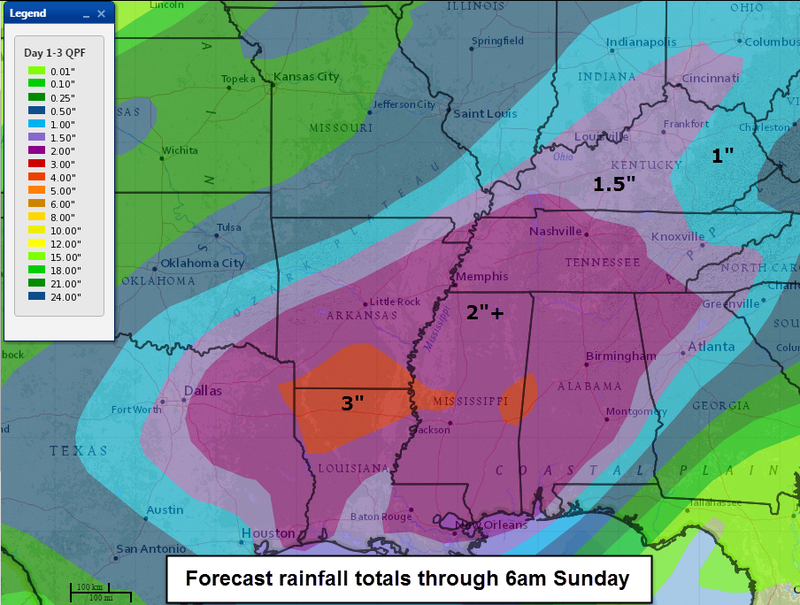 2015 starts off wet with 2" or more of rain expected through January 3. 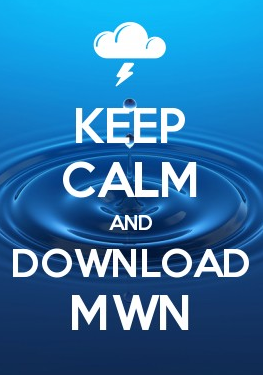 Follow us on social media all day for any reports of sleet (feel free to send your reports) and keep an eye on your MWN mobile app for the latest conditions, radar and forecast. You can also send your precip type reports via #mSpotter in the app or the mPing app. Both are very helpful to us!